The girls and I saw How to Train Your Dragon when it was in the movie theater, and we LOVED it. We loved it so much that we bought the DVD as soon as it released. I can't tell you how many times we watched that movie when we first got the DVD home. No matter how many times it played... I enjoyed it. And now... How to Train Your Dragon is a live show! We haven't seen How to Train Your Dragon Live Spectacular... but it will be playing at the IZOD Center in East Rutherford, NJ from September 27th to 30th, and we're going. After watching the video preview of the show I can not wait. It looks so exciting! Firebreathing Dragons Soar Through Arena Skies at the Izod Center Sept. 27 to 30. Audiences across North America are experiencing the magic of fire-breathing dragons that soar through arena skies in DREAMWORKS’ HOW TO TRAIN YOUR DRAGON LIVE SPECTACULAR. The tour delivers 23 dragons, some with wingspans of up to 46 feet, Viking warriors and world-class circus artists and acrobats, to perform against a state-of-the-art, wall-to-floor immersive projection measuring more than 20,000 square feet. The show comes to the North America on the heels of smash hit run in Australia & New Zealand. Visit the website for information, video previews and more. 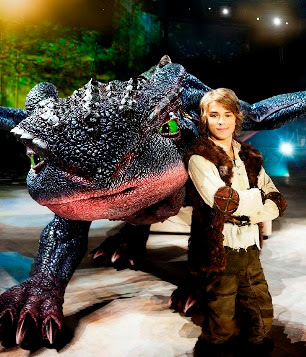 HOW TO TRAIN YOUR DRAGON LIVE SPECTACULAR will play at Izod Center from September 27 - 30th. Tickets are on sale now and start at $24.50 plus applicable facility fees and service charges. Tickets are may be purchased through the arena Box Office, by going to Ticketmaster.com or calling Ticketmaster at 800-745-3000. A limited number of premium seats and special VIP ticket experiences and family packages are also available. CLICK HERE to purchase tickets, for showtimes and much more. There are three amazing VIP packages as well. CLICK HERE for details on how to meet the dragons as well as other VIP opportunities! The live production rolls fire-breathing action, epic adventure and heartfelt laughter into an original captivating story set in the mythical world of Vikings and wild dragons. Based on the book by Cressida Cowell, it centers on Hiccup, a Viking teenager who doesn’t fit in with his tribe’s longstanding tradition of heroic dragon slayers. Hiccup’s world is turned upside down when he encounters a dragon that challenges him and his fellow Vikings to see the world from an entirely different point of view. The story presents a vision so grand in scale that only DreamWorks Animation and Global Creatures could bring How to Train Your Dragon to life in front of a live audience. It's not to be missed! * SAVE 25% on weekday performances (select premium seats), including Friday night, by entering the code MOM in the promo box which says "Promotions and Special Offers" Get great seats for a big discount! * Tickets only $20 at the Friday, September 28th 11:00 AM show. To order tickets please call 201-460-4370 and mention code SCHOOL. Offer valid on select seats while supplies last. Fees apply. This discount is only valid by calling the number above. Disclosure: I am going to see How to Train Your Dragon Live Spectacular at the IZOD Center with 4 complimentary tickets. In exchange I am sharing the above discount codes with my local readers and will write an honest review after seeing the performance. All of the opinions expressed are my own.